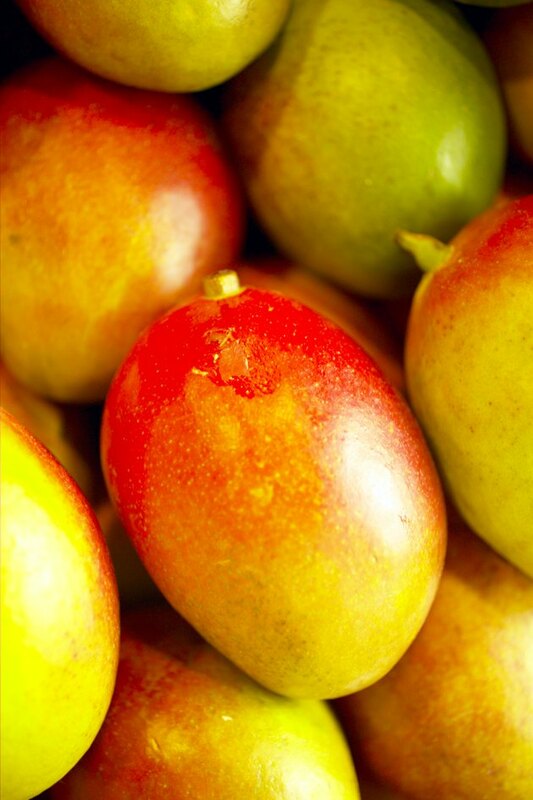 Mangos are a sweet, juicy tropical fruit that typically become ripe in summer. The bad news is, you must live in a tropical or subtropical climate zone for this tree to prosper. The good news is that if you do live in the tropics, many varieties of this fruit tree exist and are relatively easy to grow. Grafted trees grow and produce faster than trees you grow from seed; thus, if you start right, you will be enjoying your own homegrown mangos within two to four years. Grafted mango trees grow faster than when beginning from seed. Grow your grafted mango tree under the most conducive environmental conditions. Trees must have full sun and fertile soil. Add organic compost to the planting area at the ratio of 1 part compost to 4 parts soil. Water new trees two or three times the first week, flooding the area surrounding the trunk. During the following few weeks, water your tree once or twice a week. Pull weeds around your tree and keep them pulled. Mulching with organic materials such as compost will help you keep weeds away. Fertilize your tree after new growth begins, giving it a high nitrogen plant food monthly until fall. Increase the amount of fertilizer as the tree grows larger. Feed your tree a lower-nitrogen plant food or blossom booster in the spring before it begins to flower. This will encourage flowering and fruiting. Refer to product instructions for correct application.